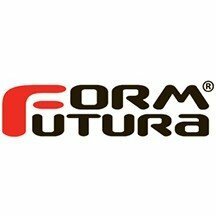 The FormFutura brand specialising in FDM 3D printing, is based in Europe and produces filaments of different types. The 1.75mm and 2.85mm filaments are available in ABS, PLA and other materials. FormFutura ensures the regularity and the diameter of its filaments throughout the manufacturing process. FormFutura filament spools have a good quality/price ratio, find all the colours and materials at the best price for your online purchase at Makershop3D. Formfutura offers 3 product lines, starting with the ABS that have been designed to generate a minimum of detachment during printing but also to ensure minimal deformation during cooling. Formfutura also offers PLA filaments in 1.75mm and 2.85mm with these filaments having the advantage of being very easy to print, but also of being odourless and biodegradable. Finally formfutura offers Flexifil filaments which are highly resistant to heat, impact and UV rays making this range ideal for printing belts or for creating an object with a rubbery appearance. And to conclude formfutura offers a PET HDglass range, providing filaments for FDM 3D printers that are very easy to print, odourless and also very durable. This filament allows you to produce 90% translucent and clearly defined creations. Formfutura offers a range of non-proprietary filaments that have excellent quality/price ratio and we offer a wide range of colours available on Makershop3D. Formfutura wants to make filaments for FDM 3D printers more mainstream while offering high-quality products so Formfutura controls the regularity and the diameter of its filaments throughout its production process. You will find all the information you require regarding the colour and diameter of the filament, the printing temperature, and the printing speed. For questions about the filaments or 3D printers please contact our technical team.